Claimed by Jets from Cincinnati Stingers in Dispersal Draft, June 9, 1979. Traded to St. Louis Blues for Rick Bowness, June 19, 1980. 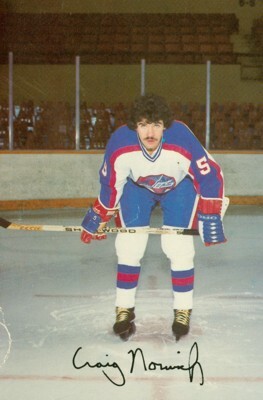 The Jets acquired defenseman Craig Norwich during the summer of 1979 and he spent one season with the Jets before being traded to the St. Louis Blues the following off-season. He was one of the mainstays on the blue line during the Jets' first season in the NHL, but after one more season split between the Blues and the Colorado Rockies, he wound up his playing career with stops in the minor leagues and Europe. Norwich broke into pro hockey with the Cincinnati Stingers and spent two seasons with them before joining the Jets. Despite the Jets' international flavor over the years, he became the Jets' first U.S.-born player when he was acquired. As a Jet, he was most noted for playing a major role in the first NHL goal the Jets gave up, leaving a drop pass for Greg Malone of the Pittsburgh Penguins, who walked in alone on Gary Smith and scored.